A tasty twist on the classic, this cheesy vegetarian Spaghetti Squash Parmesan is a guaranteed win for dinner! In all seriousness, we are straight up crushing spaghetti squash lately. Between my spinach-studded spaghetti squash and its buffalo sauced bff, dinnertime around here has been downright delicious. 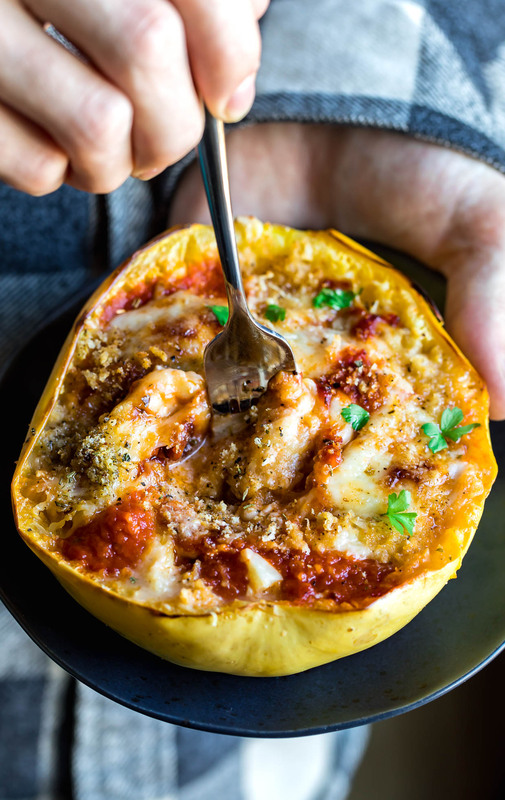 To mix things up a bit, I decided it was time to introduce another stuffed spaghetti squash recipe into rotation, and I’m so stinkin’ excited about this one it’s ridiculous! Imagine everything that’s amazing about chicken parmesan in spaghetti squash form. It’s pretty incredible! 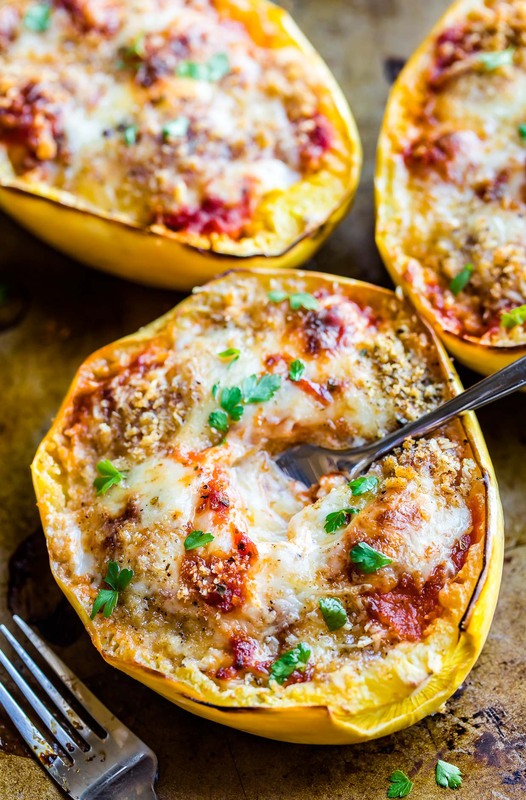 Tender strands of spaghetti squash are twirled with a trio of cheeses and fragrant marinara and garlic then topped with nutty Parmesan cheese and seasoned breadcrumbs for a toasty finish. You’re welcome to add chicken to the mix if you’d like, though I decided to keep mine gloriously vegetarian this time around. 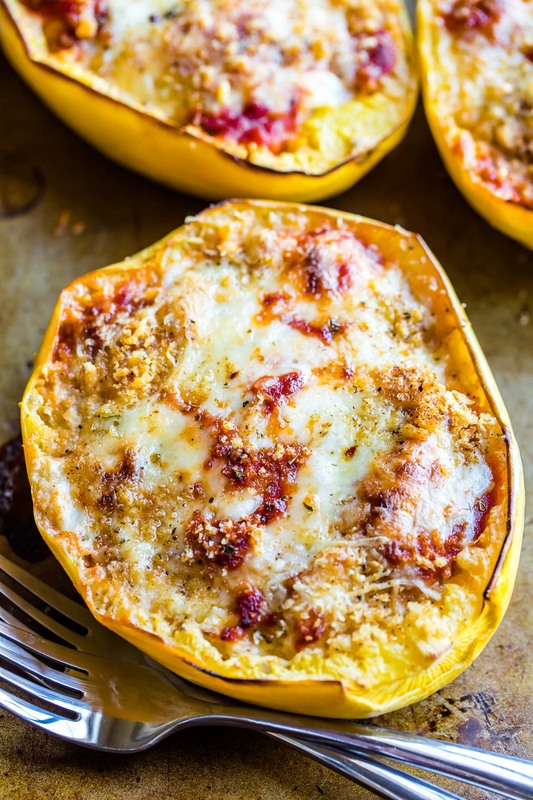 This easy, cheesy spaghetti squash parmesan is total comfort food! Warm up a chilly night with this cozy squash recipe. Doubling as a main dish and a side dish, this spaghetti squash parmesan is a tasty vegetarian twist on the comfort food classic! Slice the end off your spaghetti squash where the stem is (to give yourself a flat base to place on the cutting board) then slice in half lengthwise and scoop out the seeds. Repeat for each squash. Next grab a lipped baking sheet. Rub the cut side of the squash with olive oil and place on your baking sheet and roast face-down for about 30 minutes, or until tender and easily pierced with a fork. Cooking time will vary a bit depending on the size of your squash: Two 1.5 lb spaghetti squash will take about 30 minutes, one 3 lb squash will take 40-45 min. While the squash roasts, grate your cheeses and measure out the remaining ingredients. Combine minced garlic with a drizzle of olive oil an a pinch of salt, then microwave for 30 seconds, until fragrant. Alternatively you may sauté it if preferred. Season ricotta with half your mozzarella, half the parmesan cheese, garlic mixture, Italian seasoning blend, crushed red pepper flakes, and a little parsley if desired. The red pepper flakes add a bit of spice so if you're not a fan, totally leave them out! Once squash is ready, allow to cool, then fluff the spaghetti-like strands with a fork. Divide the ricotta cheese between squash boats and gently fold in the mixture. Add a little more mozzarella to each boat, dollop on your marinara (a thicker sauce works better here), and top with remaining cheeses. Top with a sprinkling of Italian seasoned panko (you may even add al little extra seasoning if desired - I do!) and bake on your baking sheet for 25 minutes at 400 degrees F.
Sprinkle on your choice of fresh herbs for a tasty green garnish and dive in while it's hot! ** You can use pre-seasoned Italian style panko or season them yourself with a little extra Italian seasoning to taste. Gluten-Free panko breadcrumbs also work marvelously as a topping! You can even make toasty seasoned breadcrumbs at home using your favorite GF or regular bread. Have a large spaghetti squash on hand? You can easily make this with a 3 pound squash! Bake time for the roasted squash halves will be around 40-45 minutes, so adjust accordingly and you're good to go. Feel free to add extra cheese, sauce, and seasoning as desired. Let your taste buds be your guide for this easy cheesy recipe! If you get a chance to try this cheesy vegetarian spaghetti squash parmesan, let me know! Leave some love in the comment form below or tag your photos with @peasandcrayons on Instagram so I can happy dance over your creation. Love a good edible garnish? You can sprinkle these cheesy vegetarian spaghetti squash parmesan boats with fresh parsley, basil, or even chopped spinach for a gorgeous green garnish that tastes great too! Looking to add some extra protein? 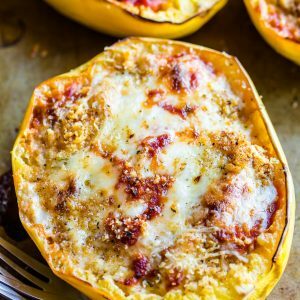 This spaghetti squash parmesan can be made with chicken, crumbled Italian sausage, or meat sauce if you’d like a T-Rex spin on things. Gluten-Free? Snag some gluten-free panko or make your own GF breadcrumbs to top this dish with. To keep things low-carb or keto-friendly, you’re welcome to skip the breadcrumb topping altogether. This sassy stuffed squash doubles as a main dish and a side dish, so serve it up any which way you choose! It’ll pair great with your favorite protein or a big green salad packed with veggies. You could even go Parmesan-crazy and serve up my zucchini parmesan chips as an appetizer, though if you do I expect an invite to this insanity! If you’re on a spaghettis squash kick like we are, feel free to check out our full collection of spaghetti squash recipes HERE. It just doesn’t get any better than this! 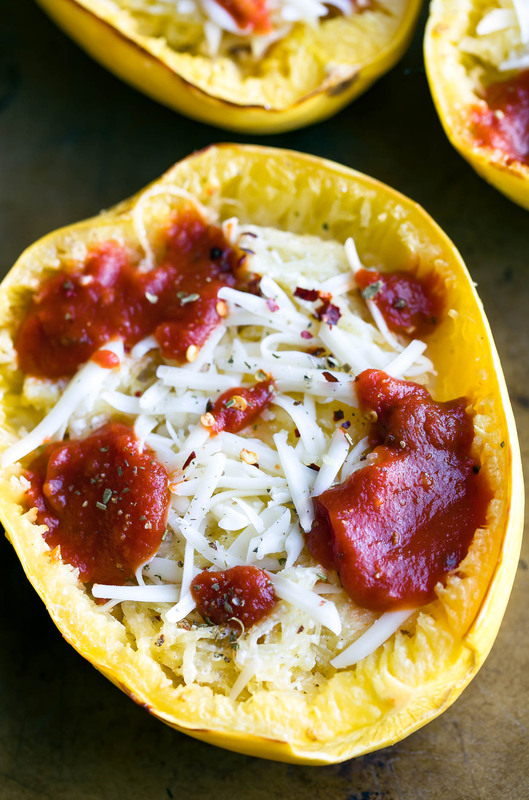 We love stuffed spaghetti squash around here and this recipe was another hit. This recipe is a winner! I’ll be making it again and again! We love this recipe. So good. Made it several times. This dish is so delicious! I am now hooked on it!! Yum! I will have to try this. Makes a good Meatless Monday recipe! Is spaghetti squash not the greatest life saver ever? I mean, it just leaves so many carbs left over for dessert! I mean… it just cuts so many carbs. Yeah… that. Bahahaha! I like the way you think! This looks so beautiful and delicious. Just an art. Great Idea for serving it.